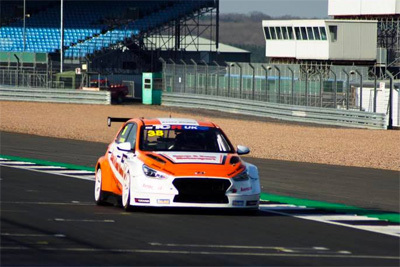 The team had the opportunity of competing in a one off race meeting for the BRSCC Saloon Car Trophy for all types of saloon car, an ideal opportunity for Lewis to try the TCR Hyundai under competitive conditions ready for the new season. The meeting was held over one day at Silverstone on the National circuit with 15 mins qualifying and two 15 min races. Lewis qualified 2nd in wet conditions with the car still on a dry set up. The team decided that just putting wet tyres on would be sufficient for what we hoped to achieve. Race 1: Race 1 was a non event for us with the car breaking a drive shaft on the green flag lap, the car was pushed into the pits and the team managed to change the shaft in record time (6 minutes) to allow Lewis out onto track to get a feel for the car in changing conditions, he soon got into the swing of things setting fastest lap, after fastest lap. Race 2: Race 2 took place in bright dry conditions but with Lewis starting 15th on the grid, no problems this time with mechanical failures and Lewis got off to a flying start moving up to 3rd place by the end of lap one. Lewis continued to set fastest laps as he chased down the race leader and once he court up with him, he made easy work of getting past. Lewis went on to win by 12 seconds. A fantastic result from the lowly grid position he started from, if he can carry this form forward to the first TCR meeting I think we are in for something special. This entry was posted in Race Reports, TCR UK and tagged BRSCC Saloon Car Trophy, Essex And Kent Motorsport, Lewis Kent, TCR, TCR UK. Bookmark the permalink.